Investors were skittish the day before first-quarter earnings reports from major Wall Street banks were due to be released, as declining earnings expectations caused uncertainty across financial markets. Currently, first-quarter earnings are expected to decline 4.2 percent year over year for S&P 500 companies, according to FactSet, which is slightly lower than the 3.9 percent decline predicted just one week before. If this prediction rings true, it would be the largest year-over-year decline in earnings since the first quarter of 2016. How should investors react to this expected decline? Investing.com spoke with Delegate Advisors Co-Chief Investment Officer and Chief Compliance Officer Jim Powers to answer this question. To read the entire Investing.com article, click here. 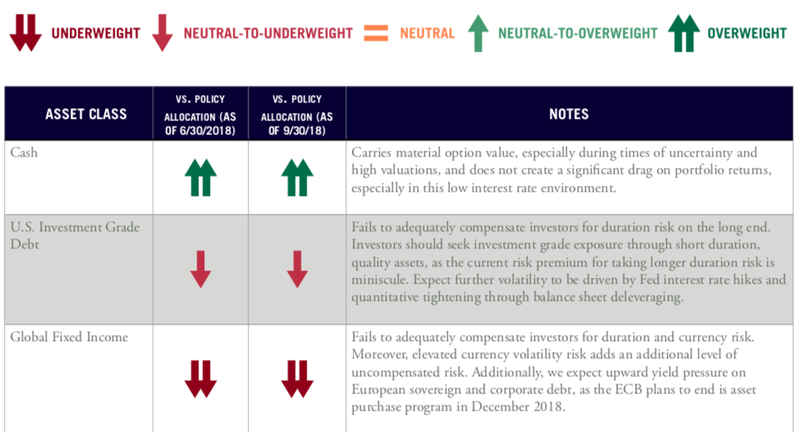 In our Delegate Advisors Asset Class Indicators for the first quarter of 2019, we raised our outlook for emerging market equities from underweight to neutral-to-overweight, reflecting what we believe to be an attractive long-term opportunity. The shift in outlook is based primarily on the current valuation of the asset class. As shown in the below chart, the cyclically-adjusted price-to-earnings ratio (“CAPE”) for emerging market equities was 12.1 as of 12/31/2018, well below its 10-year average of 14.7. 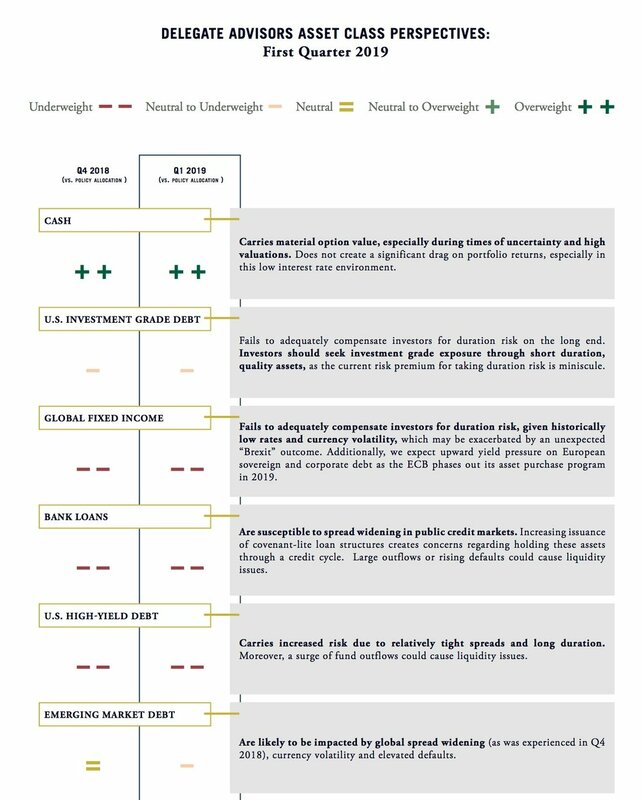 Additionally, while emerging market equities naturally have lower valuations relative to developed markets due primarily to the inherent risks of the asset class, the spread between the valuation of emerging markets and developed markets is currently wider than average, implying that, relative to global developed markets, emerging markets represent a better value. Given this backdrop, we expect emerging market equities to outperform developed markets over the long term as their valuation converges to the long-term average and as the spread between valuations for developed and emerging markets tightens. One caveat, however. While emerging market equities may currently appear undervalued, the asset class is historically very volatile, meaning that large, sudden moves (both positive and negative) are common and expected. Thus, investors who are unwilling to “ride out” this volatility should consider an alternative. We are pleased to announce that Delegate Advisors has been shortlisted for the 2019 Private Asset Management (PAM) Awards in two categories: Best Multi-Family Office - Client Service - Under $2 Billion and Best Registered Investment Advisor (RIA) for High-Net-Worth Clients. 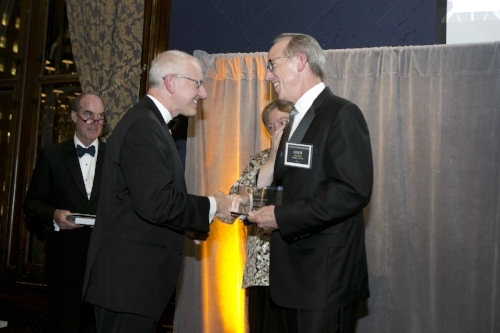 The PAM Awards recognize the best investment professionals, wealth advisors, legal firms, consultants, and other key service providers in the private wealth management industry that have achieved notable accomplishments throughout the past year. An independent judging panel made up of industry experts determines the winners of these awards by examining both qualitative and quantitative performance indicators. The winners for this year’s PAM Awards will be announced during an evening awards ceremony on Thursday, February 7, 2019 in New York. More information regarding the awards is available here. The annual Private Asset Management Awards - presented by Private Asset Management (PAM) Magazine - is an evening of recognition and reward for top investment professionals, wealth advisors, legal firms, consultants, and other key service providers operating within the private asset management industry. Judges will take part in a judging conference call, where the winners will be decided. Our expert judge per category will be asked to summarize the judges’ comments. Judges have discretionary power to move submissions into alternative categories that they think may be more suitable. All judges are required to sign a disclaimer form to keep information about entries and the final winners confidential. The judges are carefully selected for their wealth of experience and expertise, as well as their absence of conflicts of interest. Judges cannot judge any categories that their company has submitted for and are obliged to declare that they have no conflicts of interest prior to judging. We are pleased to announce that Delegate Advisors President and Chief Advisor Andy Hart is a finalist for the Family Wealth Report Awards in the Outstanding Contribution to Wealth Management Thought Leadership (MFO/Wealth Advisor/Manager) category. The winners of the 2019 Family Wealth Report Awards will be determined based on the finalists’ independence, integrity, and genuine insight. In order to ensure that commercially sensitive information is kept confidential and to avoid conflicts of interest, there will be two judging panels for the awards. One panel will be responsible for judging the private banking categories, and the other will judge the trusted advisor categories. The winners of the Family Wealth Report Awards will be announced during an awards dinner at the Mandarin Oriental in New York City on March 20, 2019. ClearView Financial Media was founded by Chief Executive, Stephen Harris, in 2004 to provide high quality ‘need to know’ information for the discerning private client community. London-based, but with a truly global focus, ClearView publishes the Family Wealth Report group of newswires, along with research reports and newsletters, while also running a pan-global thought-leadership events programme. With teams based in New York, London, Singapore, Switzerland, South Africa, and Malaysia, the company is one of the fastest-growing media groups serving the financial sector. ThinkAdvisor recently featured Delegate Advisors President and Chief Advisor Andy Hart in an article about Opportunity Zone funds. In the piece, Hart describes how Opportunity Zone funds might attract investors who are sitting on gains of highly appreciated assets, such as tech stocks, and want the ability to defer taxes on those gains. Because the final rules and regulations regarding Opportunity Zones have not yet been finalized, most funds attempting to capitalize on them have not yet come to market. We anticipate that, once the rules and regulations are final, fund managers will begin aggressively marketing investment options. Opportunity Zones are often high-need communities selected by states and are located throughout the U.S. Thus, Opportunity Zone funds not only have the potential to provide tax benefits for investors, but also the potential to create positive impacts on low-income communities. In fact, Opportunity Zone funds might become a viable option for investors with capital gains, a long time horizon, and a desire to make socially responsible investments. With Opportunity Zone funds, investors can receive certain tax benefits with respect to their capital gains as long as they reinvest their gains into a fund that places a defined proportion of its assets into a business located in an Opportunity Zone. Find ThinkAdvisor’s entire Opportunity Zone funds article here. At a high level, two primary causes of the GFC were poor underwriting of mortgages and a long period of deregulation. As home prices began to rise in certain parts of the country (e.g., South Florida, Las Vegas), lenders loosened underwriting standards to almost comically low levels under the false belief that home prices would always remain high. The resulting toxic mortgages were packaged together in often highly leveraged, illiquid structures and held by, in many cases, depository banking institutions and investment banks. When home prices crashed and these structures collapsed, the investment banks’ capital (e.g., Bear Stearns, Lehman) immediately dried up and “mom and pop” began to fear that they would not be able to withdraw from their local bank because it had invested their deposits into these toxic structures. This occurred against a backdrop of an almost 30-year period of capital market expansion and deregulation beginning with the savings and loan crisis of the mid-1980s, a small-scale prototype for the GFC. Lessons that markets and investors learned as a result of that crisis were apparently forgotten. Since the GFC and until very recently, the regulatory pendulum has swung in the opposite direction, toward more regulation rather than increased deregulation. The Basel Accords III and the Dodd-Frank Act were attempts to rein in many of the practices that caused the GFC and strengthen banks’ capital requirements to prevent future insolvency. These new regulations caused a boom in the “shadow banking” industry, which sounds nefarious but is really just the business of private lending outside of the banking system. 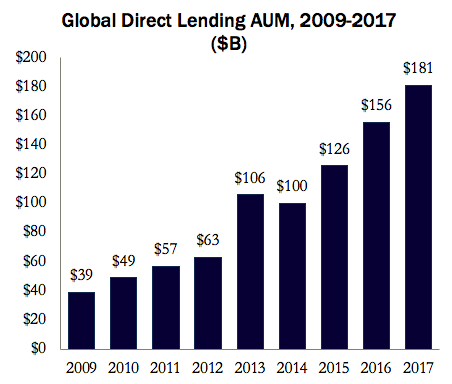 Since the GFC, as illustrated below, global private direct lending assets under management has increased from $39 billion to $181 billion, a 4.6x increase over an eight-year period. This shift is generally thought of as a positive effect of the GFC, because the riskier loans are now knowingly held by sophisticated investors (e.g., pension funds, endowments, ultra-high net worth families), rather than by depository institutions who used “mom and pop” deposits to fund suspect investments. While the growth of private lending is an encouraging sign, the explosive growth of public high-yield “junk” and bonds rated BBB has created the potential for future distress. 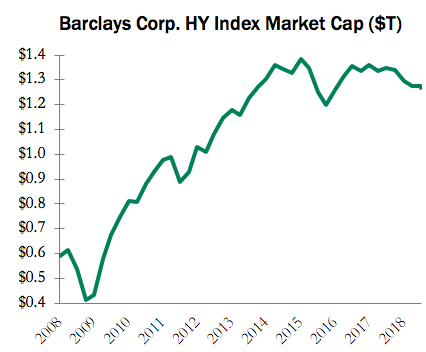 As shown below, the size of the domestic corporate high-yield market has tripled since 2009. Not only has the size of the market grown drastically, lenders have increasingly agreed to relaxed covenants, which limit their ability to monitor borrowers and to take action if necessary to limit the risk of a default. While BBB-rated debt is still considered investment grade, it is the lowest-rated class of investment grade bonds. Since 2008, the total value of the investment grade market has grown from $4.8 trillion to $9.3 trillion. In 2000, BBB-rated debt comprised about 20% of the investment grade market ($1.2T). Now, BBB rated debt comprises over half of the investment grade market ($4.8T). The primary reason for the growth in both high-yield and BBB-rated debt is that investors, facing historically low interest rates, are searching for yield in increasingly higher-risk investments. If there is a troubling sign for the current economy, this is it. While “mom and pop” are somewhat more insulated from risk with their cash at the bank than ten years ago, retirement accounts might be invested in riskier investments than they realize. Additionally, many of these risky investments are packaged in increasingly popular ETFs and mutual funds that offer overnight liquidity and so are obligated to sell when they get redemption requests, regardless of whether it is prudent to do so. In summary, while private debt investments are protected by lock-ups that prevent the need for “forced selling”, public investments in ETFs that hold risky debt would likely become stressed in a credit or liquidity event similar to what occurred during the GFC. To mitigate against this risk, we have generally advised clients to reduce high yield exposure to zero. Use long-term planning to avoid getting into a liquidity bind. At Delegate, we treat each client like their own financial system and project their cash needs far out into the future to determine how much cash and short-term, liquid investments to hold in case the economy’s gears grind to a halt. Have a plan in the event of a crisis. Work with a trusted advisor to understand what would cause personal stress in such an event, and establish a plan to mitigate that stress. Create an investment plan designed to be opportunistic in a crisis, capitalizing on fear and market dislocations. The best time to establish a crisis plan is when there’s not a crisis (i.e., now). While economic activity is expected to remain strong, financial assets may struggle to generate compelling absolute returns due to high current valuations and the fading effects of fiscal and monetary stimulus. With the still-present tailwinds of the corporate tax cut driving earnings ever higher and the continuing expansion of corporate stock buyback programs providing price support for equities, however, this economy has positive momentum that we believe can take it well into 2019. In the third quarter, domestic equity market values continued to increase, reaching new, all-time highs. The strong performance was driven by the ongoing results of last year’s tax cuts, which have boosted corporate profits throughout the year. Markets continue to discount potential bad news, notably, signs of a trade war brewing with several of the United States’ largest trade partners. While an outright trade war would certainly be a negative for the global economy, markets seem to believe that a neutral or even positive outcome is more likely in the form of renegotiated trade agreements. For example, the U.S., Mexico and Canada recently agreed on a renegotiated NAFTA, with Canada seemingly capitulating to the U.S.’s aggressive negotiating tactics. A renegotiation of trade terms with Europe is likely next up, with China looming. As the quarter turned, however, global equities sold off quickly and deeply, with markets showing signs that the decade-long bull market may be nearing an end. The end of bull market expansions is typically marked by several run-ups to record highs and “corrections” before capitulation to an inevitable recession. In times like these, we remind our clients that long-term investors should be less concerned with daily volatility and that investment returns should be measured over an economic cycle (i.e., 8-10 years). In this regard, we are generally advising clients to reduce public equity exposure to the low end of policy ranges, and to tilt equity exposure toward value over growth. As illustrated below, domestic value stocks have underperformed growth over the last ten years. This will likely reverse over the next phase of the market cycle, as growth stocks tend to outperform in bull markets, while value outperforms in bear markets. Family offices currently face a heightened vulnerability to cyberattacks. To help family offices tackle these threats, MarketCurrents recently sat down with Delegate Advisors President, Chief Advisor, and Managing Partner, Andy Hart, to discuss why family offices need to protect their data more meticulously than the average corporation, and the best ways to do it. With substantial experience following cybersecurity best practices in the family office industry, Hart understands cybersecurity and cyberattacks well. During his Q&A with MarketCurrents, Hart explained how the issue of cybersecurity became a priority to him after witnessing a handful of sophisticated cyberattack attempts. “Our first attack happened about six years ago and we were lucky to stop that one,” says Hart. “Ever since then, we have been vigilant and we feel we’ve done a pretty good job by strongly advising our clients to take certain actions on their side to button up the situation.” To protect yourself from cyber-related threats, Hart recommends simple actions to greatly reduce or eliminate the odds of future cyberattacks such as freezing credit, two-factor authentications, email security, and low balance alerts on credit cards. In addition to explaining how families can minimize their chances of getting defrauded, Hart also discusses how to reduce the chances of internal breaches at family offices through extremely thorough background checks during the hiring process, weekly scrubs of data from all computers, filters that compel employees to use complex passwords that are changed frequently, and more. To learn more about tackling cybersecurity risks, read the full Q&A here.